Not quite forty years old, Harrison Jim is an accomplished silversmith who works in many styles but favors the classic designs best described as Navajo Traditional Revival. His work is done in the old-fashioned way by melting silver, rolling it out and hammering it to form his pieces. His work is very often decorated by free-hand cold chisel work, a technique more common to an earlier era of Navajo smithing which requires great practice and skill. 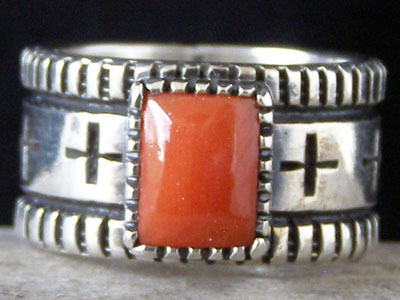 This ring is set with a rectangle of Mediterranean red coral in a handmade, notched bezel. Four corners crosses are deep-stamped along the equator of this uniform-width band. The stampwork has further texturing visible within the recesses of the crosses and grooved edges. Splendidly detailed work! Hallmarked "HJIM" by a jeweler's scribe inside (where the "H" is above the "J" in "JIM").